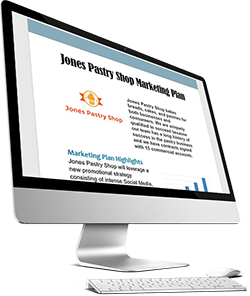 The World’s #1 Marketing Plan Template -- it’s the quickest and easiest way to create a winning marketing plan, period! I’m honored and flattered to have been recognized as the world’s foremost planning expert by BusinessWeek, Forbes and others. Seventeen years ago we started writing business and marketing plans for marketing professionals, executives and business owners like you. Using this vast experience, we have created and constantly refined Growthink’s Ultimate Marketing Plan Template to be the hands-down quickest and easiest way to create a winning marketing plan that allows you to dramatically increase sales and profits. "My Business Has Improved Dramatically"
We’ve created simple, fill-in-the-blank exercises that guide you through all the key questions your marketing plan must answer. Just read our tips, examples and questions, and type your answers directly into our template and you’re done! We have identified, and our template succinctly describes, the world’s 28 most effective promotions strategies. You’ll simply review the strategies (which will take you less than 10 minutes) and select the ones that will work best for your business. Growthink’s Ultimate Marketing Plan Template gives you strategies to easily outperform your competition online. It takes you through the 4 key components to your online marketing strategy (Keyword Strategy, Search Engine Optimization Strategy, Paid Online Advertising Strategy, and Social Media Strategy) and then shows you how to succeed in each. Do you want customers to pay more each time they buy from you? If so, you’re in luck since Growthink’s Ultimate Marketing Plan Template succinctly describes the core ways you can maximize transaction prices. It even includes several examples of how other businesses have used and profited from them. Like in other areas, you’ll simply select your favorite methods from our list and be done with this key section of your marketing plan. Simply type in some numbers, like the number of products or services you expect to sell, your prices, and the cost of the promotional strategies you’ll use, and our template automatically calculates your complete financial projections. You’ll be able to quickly see what affect each of your marketing strategies will have on your bottom line. Our Ultimate Marketing Plan Template comes with 365 days of free customer support. You not only get access to our amazing customer support team, but our Ultimate Marketing Plan Template “Members Area” gives answers to all your questions, plus access to valuable resources such as SEO and social media strategies to improve your marketing success. Once you purchase Growthink’s Marketing Plan Template, you have lifetime access to use it. You can use it every year to update your marketing plan, or for any other business in which you’re involved, now or in the future. Our Ultimate Marketing Plan Template has been used to quickly and easily create winning marketing plans in every conceivable industry, including yours! Whether your business is a restaurant, day care center, non-profit, software company, hotel, or anything else, we have you covered. In fact, it just might be a marketing technique that's used more often in a DIFFERENT industry that proves super successful in yours! You simply download, personalize & print our Microsoft Word® and Excel® compatible Ultimate Marketing Plan Template. And it works flawlessly on both PCs and Macs. When you order, we give you instant access to "Insider Sales & Marketing Secrets Revealed" ($197 value). This program includes audio records to 7 "closed door" conversations I recorded with some of the world’s best sales and marketing experts, including best-selling authors, ultra-successful entrepreneurs, and super high-priced marketing consultants. We not only help you quickly and expertly finish your marketing plan, but we help you to efficiently implement all the new strategies and tactics you include in it. “I had tried other marketing plan templates in the past, but yours is better. “Dave’s marketing plan template made all of this achievable. The excel spread sheets built beneath or into their forms made it easy to provide forecasts and budgets. I just had to enter in our average check and amount of covers (customers) we anticipated feeding every day and then our historical expense percentages and the spreadsheet did the rest of the work. When I had a question I just needed to call his team up. They were knowledgeable, helpful and friendly. Here's our promise: Purchase today 100% risk-free because Growthink’s Ultimate Marketing Plan Template comes with a full 365 Day 100% Money Back Guarantee. I’m new at this…. Can I really create my marketing plan myself? Yes, you can! Anyone can easily follow our basic instructions and create a great marketing plan quickly and easily. Plus, my expert team is available to help you if you have any questions. Yes. Growthink’s Ultimate Marketing Plan Template has been used in more than 500 industries to create successful marketing plans. It has been specifically designed for easy customization for any business. Growthink’s Ultimate Marketing Plan Template is designed for both established businesses and startups, and both for-profit and non-profit businesses. Yes, Growthink’s Ultimate Marketing Plan Template works flawlessly on both PCs and Macs. How many marketing plans can I create with this? You can create an unlimited number of marketing plans with Growthink’s Ultimate Marketing Plan Template. Once you purchase it, you have lifetime access to use it. You can use it every year to update your marketing plan, or for any other business in which you’re involved, now or in the future. Unlike other software that charges you a fee month after month after month, you only pay once for Growthink’s Ultimate Marketing Plan Template and you own it. How quickly can I access Growthink’s Ultimate Marketing Plan Template? Immediately upon purchasing Growthink’s Ultimate Marketing Plan Template, you will be sent an email with links to instantly download our template and begin working on your marketing plan.